Donnis' birth was noted in the "Ogden Standard-Examiner" (Ogden, Utah) on Sunday, May 23 19481 (see scan below). 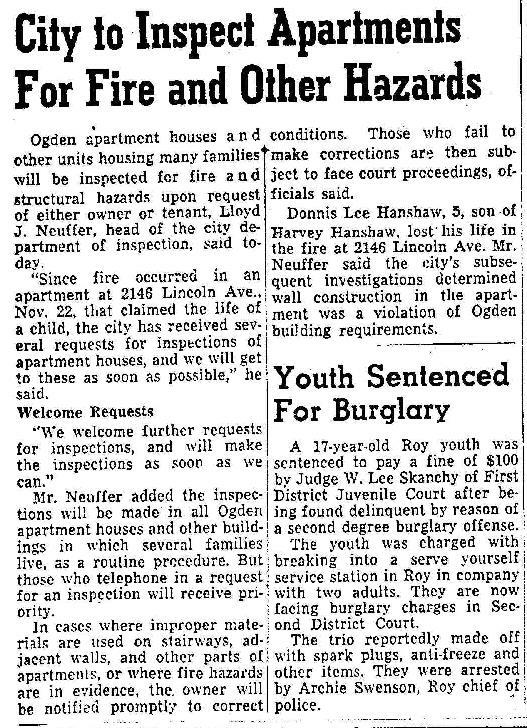 Donnis died in an apartment house fire.2,3 His death was reported in the "Ogden Standard-Examiner" (Ogden, Utah) on Thursday, December 3, 19532 (see scan below). "Ogden Standard-Examiner", May 23 1948; http://www.ancestry.com. "Ogden Standard-Examiner", Dec 3 1953; http://www.ancestry.com. "Ogden Standard-Examiner", Dec 27 1953; http://www.ancestry.com.